This is a card I made for a baby shower of friends of ours. The baby's not born yet but they know they are having a boy. 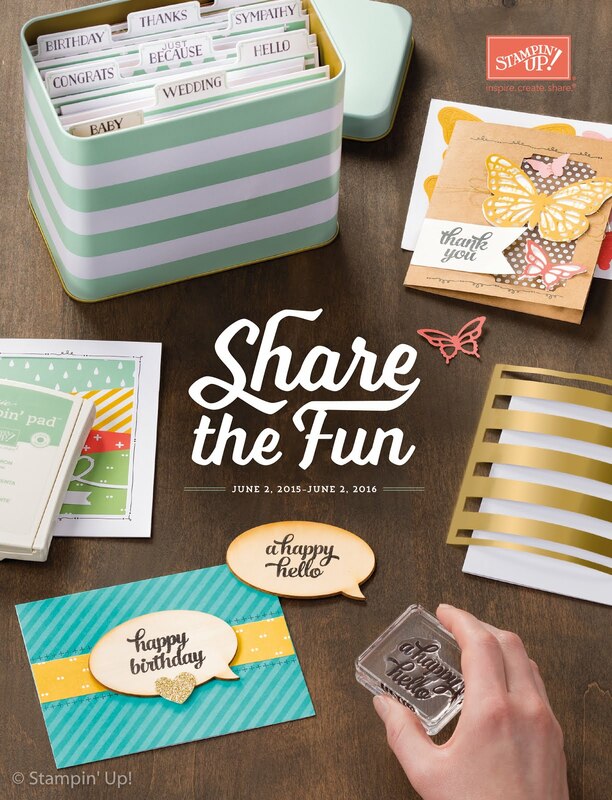 Cut Soft Sky Textured card stock 5-1/2x11, this is your base. Cut Blue Bayou card stock 5-1/2x3 and So Saffron card stock 5-1/2x3-1/4, this is the strip across the front. 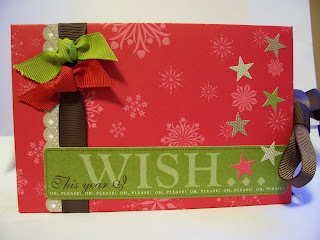 Cut Whisper White card stock 2x2-1/2 and So Saffron card stock 2-1/4x2-3/4, this is for the boat. 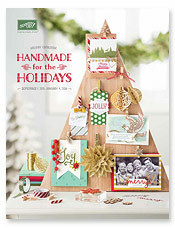 Cut Blue Bayou card stock 1-1/2x2. Using your corner rounder, scallop the edge. This is for the waves. Stamp Boat on the Whisper White card stock with Blue Bayou ink. Make sure the boat isn't covered too much by the waves. Sponge Soft Sky ink around the edges of the Whisper White card stock. Stamp the star from Nursery Neccessites on the Blue Bayou card stock in Whisper White craft ink, sprinkle with clear embossing powder, heat with heat tool. 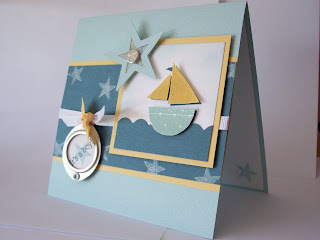 Stamp the boat from Nursery Neccessites on So Saffron Designer Series Paper and Soft Sky Designer Series Paper with the VersaMark pad, sprinkle with clear embossing powder, heat with heat tool. Cut out the boat and adhere with Dimensionals to the already stamped Blue Bayou boat. Tie Whisper White grosgrain ribbon around strip, adhere strip to base. Adhere boat square to card with dimensionals. Stamp star on Whisper White card stock in Soft Sky and stamp "It's a boy" over the star in Blue Bayou. Do this twice. 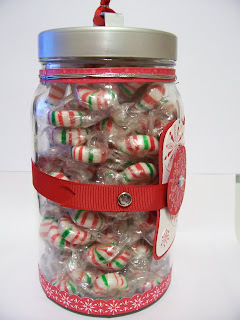 Punch these out with the 1" Circle Punch, adhere together back to back. Put these in the circle from the Stylized Silver Hardware, put another silver circle on the back. White eyelets will hold these together. Use the Crop-A-Dile to adhere eyelets. Tie the Silver circle to the White ribbon using Apricot Appeal grosgrain ribbon. 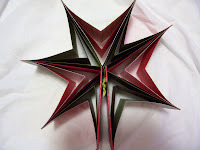 I made the star with clear acetate. I used the Large Star Punch as my guide. You cannot punch the acetate...it's too flimsy for the punch. Cut 2 stars out with scissors. Put a small drop of crystal effects in the middle of one of the stars, sprinkle Dazzling Diamonds over top, put the other star on top. The sparkles will be sandwiched in the middle. Punch a small star in Soft Sky card stock, puch large star over this one. Adhere to acetate star, put brad through, adhere with Dimensional and you're done! It looks like a lot of work but you can take any parts to make it your own. Let me know if I can help! 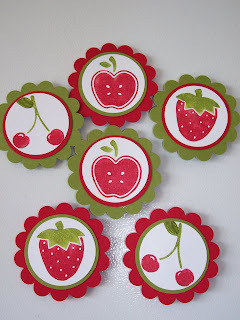 These are magnets I made out of the Tart and Tangy stamp set. I love this set! 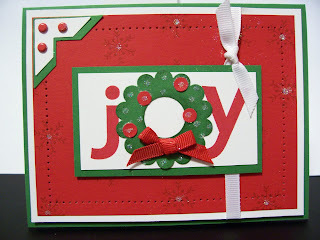 Using the Stampin' Write Markers, colour the Strawberry, Apple and Cherry stamp. I used Real Red and Old Olive. Huff on the stamp to moisten the ink and stamp the image on Whisper White card stock. Punch the images out using the 1-1/4 Circle Punch. Punch Real Red and Old Olive circles with the 1-3/8 Circle Punch. These will go behind the image. Using the Scallop Punch, punch Real Red and Old Olive scallops. Take your magnet (I got mine from the dollar store) and put a tiny drop of Crystal Effects on it; now adhere it to the scallop. Let the Crystal Effects dry. This won't take long. Now how easy was that??? 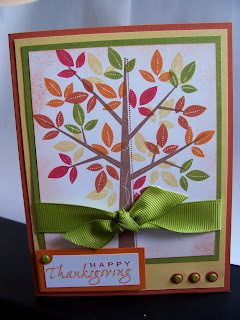 If you missed coming to my class last Tuesday, this is one of the cards we made. Cut your textured River Rock card stock to 5-1/2 x 4-1/4, fold in half. This is the base of your card. 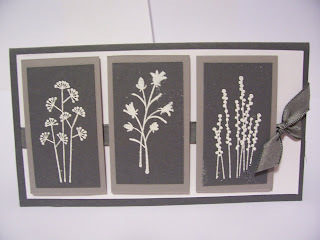 Cut two 3 x 4 pieces out of the Whisper White card stock; Cut one 3-1/4 x 4-1/4 out of the River Rock card stock; Cut one 3-1/2 x 4-1/2 piece out of the Cameo Coral card stock; Cut one 2-1/2 x 4-1/4 piece out of the Ginger Blossom Designer Series Paper. Now you have all your card pieces. Using the Coluzzle, cut an oval out of one of the Whisper White pieces. Make sure it's centred. Layer the piece of Whisper White that has the oval cut out of it (the frame) onto the other Whisper White piece. 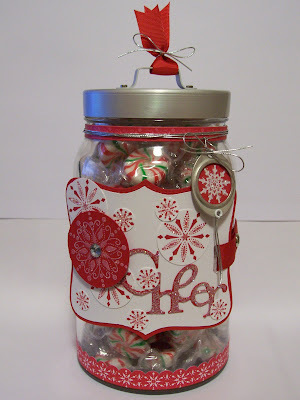 You can use removable adhesive (Dotto) to hold it together it you'd like. 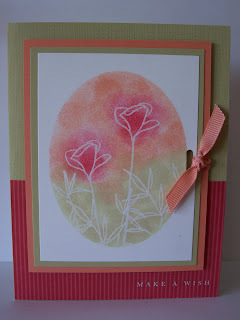 Stamp the rose and the leaves from the Embrace Life stamp set with the VersaMark ink pad inside the oval. Remove the frame and sprinkle clear embossing powder on the images. Heat with the embossing gun. Put the frame back on the Whisper White piece with the image on it. Using the Stampin' Sponges, sponge Ruby Red ink (from the pad) on the roses; Sponge Cameo Coral around the roses; Sponge River Rock on the leaves. Remove the frame and adhere the Whisper White piece to the River Rock piece; Adhere that piece to the Cameo Coral piece. Using the Horizontal Slot Punch, punch a slot into all the adhered pieces. Take the ribbon and tie it through the slot. NOTE: I died the Whisper White ribbon Cameo Coral by taking the Stampin' Sponges, inking it in Cameo Coral and then wiping the ribbon with the sponge. It dries really fast. 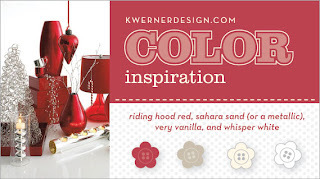 You could also use the Cameo Coral Double-Stitched Ribbon. Adhere the Designer Series Paper to the bottom half of the River Rock card. 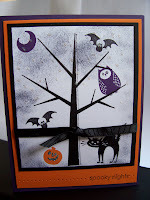 Using the Stampin' Dimensionals adhere the image to the card. Rub-on "Make a Wish" from the Eastern Elegance Rub-Ons. I love this card! It is quite elegant. You could change the sentiment so it could be any type of card you need.